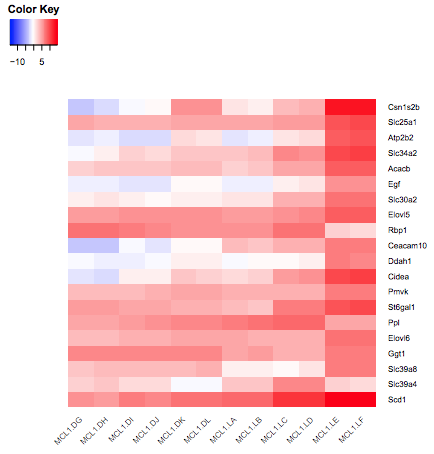 How to generate heatmaps from RNA-seq data? 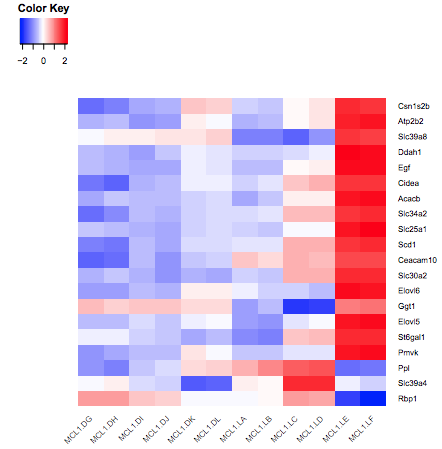 Heatmaps are commonly used to visualize RNA-Seq results. They are useful for visualizing the expression of genes across the samples. In this tutorial we show how the heatmap2 tool in Galaxy can be used to generate heatmaps. The heatmap2 tool uses the heatmap.2 function from the R gplots package. Here we will demonstrate how to make a heatmap of the top differentially expressed (DE) genes in an RNA-Seq experiment, similar to what is shown for the fruitfly dataset in the RNA-seq ref-based tutorial. We will also show how a heatmap for a custom set of genes an be created. To generate a heatmap of RNA-seq results, we need a file of normalized counts. This file is provided for you here. The expression values have been normalized for differences in sequencing depth and composition bias between the samples. To generate this file yourself, see the RNA-seq counts to genes tutorial, and run limma-voom selecting “Output Normalised Counts Table?”: Yes. You could also use a file of normalized counts from other RNA-seq differential expression tools, such as edgeR or DESeq2. We also need some genes to plot in the heatmap. The data for this tutorial comes from a Nature Cell Biology paper, EGF-mediated induction of Mcl-1 at the switch to lactation is essential for alveolar cell survival), Fu et al. 2015. 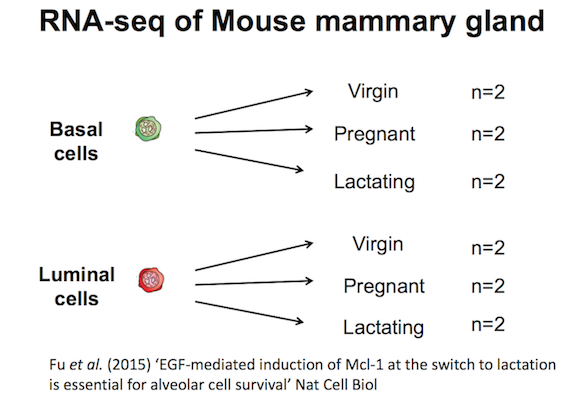 This study examined the expression profiles of basal and luminal cells in the mammary gland of virgin, pregnant and lactating mice. Six groups are present, with one for each combination of cell type and mouse status. Import the normalized counts table. Rename the counts dataset as normalized counts, the limma-voom_luminalpregnant-luminallactate file as DE results and the list of genes as heatmap genes using the galaxy-pencil (pencil) icon. Click on the galaxy-eye (eye) icon of the the DE results file and take a look. It should look like below with 8 columns (just the first few rows are shown). First we’ll demonstrate how to create a heatmap of the top differentially expressed genes in an RNA-seq dataset. To do this we need to extract the differentially expressed genes from the DE results file. 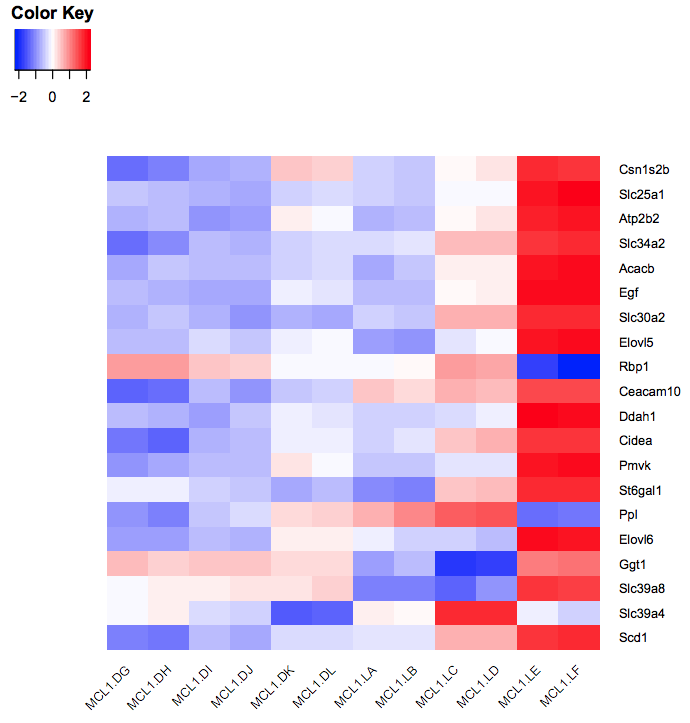 This file contains the results from comparing gene expression in the luminal cells in the pregnant versus lactating mice. It includes genes that are not significantly differentially expressed. As in the RNA-seq counts to genes tutorial), we’ll call genes significantly differentially expressed in this dataset if they pass the thresholds of adjusted P value < 0.01 and fold change of > 1.5 (log2FC of 0.58). This gives us a file with all the significant genes, the genes that pass our thresholds for statistical and biological significance. As we can see there are many genes (~1,610), too many to plot in one heatmap, so we’ll select the top 20 by P value. Now we have a file that contains only the top 20 genes from the DE results. Next we need to get the normalized counts for these genes, from the file containing the normalized counts for all genes in the experiment, and then extract just the columns we need for the heatmap (the normalized counts and gene labels). First click on the galaxy-eye (eye) icon and take a look at the normalized counts file that we imported. It should look like below (just the first few rows and columns are shown). Note that the normalized count values are log2. We will join our top 20 by Pvalue file to the normalized counts file, matching on the ENTREZID columns. The generated file has more columns than we need for the heatmap. In addition to the columns with normalized counts (in log2), there is the and other information. We need to remove the extra columns. The file should look like below with the 20 genes in the rows and the 12 samples in the columns (just the first few columns are shown). Now that we have our file with just the normalized counts for the genes we want, we can create a heatmap. You should see a heatmap like below. 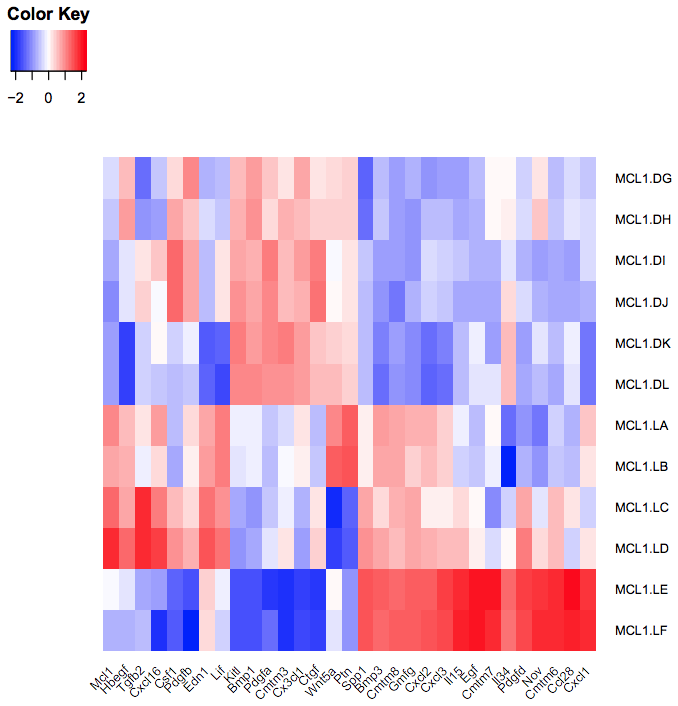 Note that here we are plotting the top genes differentially expressed in the luminal cells from the pregnant mice (MCL1.LC and MCL1.LD) versus the luminal cells from the lactating mice (MCL1.LE and MCL1.LF). This heatmap enables us to see the expression of these genes in all the samples from the different groups in the experiment (basal virgin, basal pregnant, basal lactating, luminal virgin, luminal pregnant, luminal lactating). Why do we not use clustering here? Why do we scale the rows (genes)? Try rerunning heatmap2 changing the “Data scaling” parameter to Do not scale my data. The genes are ordered by P value. Can you make the heatmap with the genes ordered by fold change? Hint: Sort by the logFC column in ascending order to have the genes downregulated in the luminal pregnant vs lactating (negative fold change) at the top and the upregulated genes (positive fold change) at the bottom. How could we make a heatmap of the top 10 most upregulated and top 10 most downregulated significant genes? We don’t use clustering here as we want to keep the genes in the order we input (ordered by P value). We scale the genes as otherwise large expression values from highly expressed genes would dominate the plot, see below. To make the heatmap with these genes ordered by logFC, we could Sort the output of the Join step on the logFC column, then Cut the columns as before and remake the heatmap. It should look like below. You can also create a heatmap for a custom set of genes. 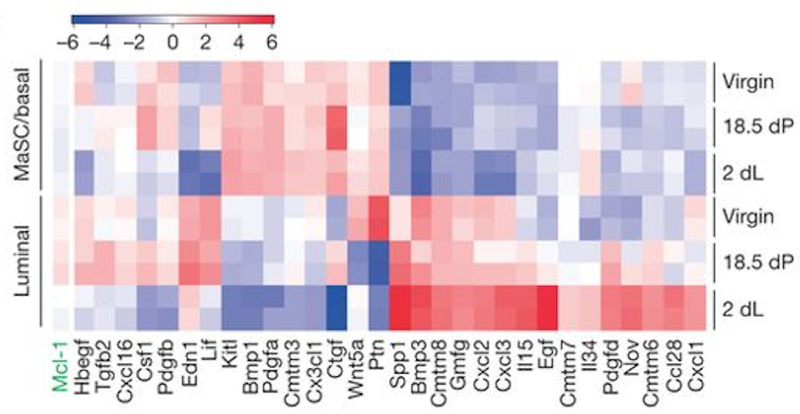 To demonstrate this, we will create a heatmap for the 31 genes in Figure 6b from the original paper using this dataset (see below). These 31 genes include the authors’ main gene of interest in the paper, Mcl1, and a set of cytokines/growth factors identified as differentially expressed. We will recreate this heatmap here. To see how to visualize these genes in a volcano plot see the tutorial here. These 31 genes are in the file we imported called heatmap genes, shown below. As in the previous example, we need to extract the normalized counts for just these 31 genes. To do that we will join the heatmap genes file with the normalized counts file, on the Gene Symbol columns this time (instead of ENTREZID), and then extract the columns we need. The genes are in rows and the samples in columns, we could leave the genes in rows but we will transpose to have genes in columns and samples in rows as in the Figure in the paper. We now have a table with the 31 genes in columns and the normalized counts for the 12 samples in rows, similar to below (just the first few columns are shown). You should see a heatmap like below. How does the heatmap compare to the one from the Fu paper Fig 6 (above)? The heatmap looks similar to the heatmap in the paper. 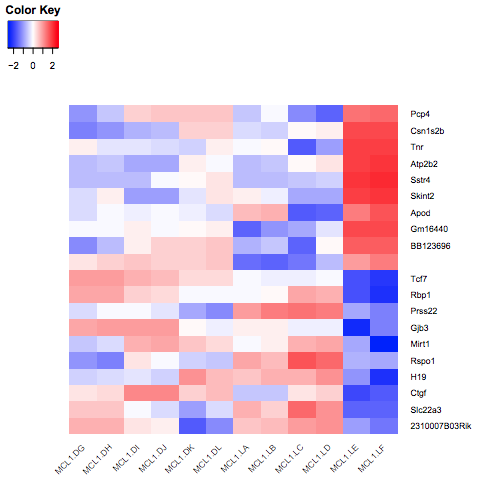 In this tutorial we have seen how heatmaps can be used to visualize RNA-seq results using the heatmap2 tool in Galaxy. We use the same dataset from the tutorials, RNA-seq reads to counts, RNA-seq counts to genes, RNA-seq genes to pathways and Visualization of RNA-Seq results with Volcano Plot.